Floods impede gas (O2 and CO2) exchange between plants and the environment. A mechanism to enhance plant gas exchange under water comprises gas films on hydrophobic leaves, but the genetic regulation of this mechanism is unknown. We used a rice mutant (dripping wet leaf 7, drp7) which does not retain gas films on leaves, and its wild-type (Kinmaze), in gene discovery for this trait. Gene complementation was tested in transgenic lines. Functional properties of leaves as related to gas film retention and underwater photosynthesis were evaluated. Leaf Gas Film 1 (LGF1) was identified as the gene determining leaf gas films. LGF1 regulates C30 primary alcohol synthesis, which is necessary for abundant epicuticular wax platelets, leaf hydrophobicity and gas films on submerged leaves. This trait enhanced underwater photosynthesis 8.2-fold and contributes to submergence tolerance. Gene function was verified by a complementation test of LGF1 expressed in the drp7 mutant background, which restored C30 primary alcohol synthesis, wax platelet abundance, leaf hydrophobicity, gas film retention, and underwater photosynthesis. The discovery of LGF1 provides an opportunity to better understand variation amongst rice genotypes for gas film retention ability and to target various alleles in breeding for improved submergence tolerance for yield stability in flood-prone areas. 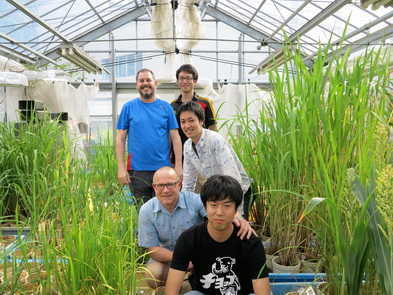 Much of the recent work of rice is done in collaboration with the University of Western Australia (Prof Colmer) and Nagoya University in Japan (Prof Ashikari). 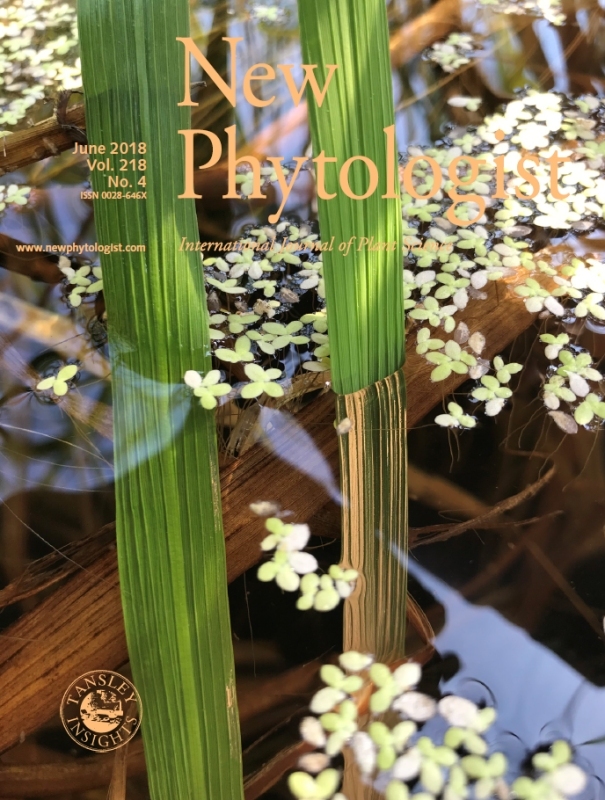 We have recently identified a gene that regulates wax synthesis in rice so that the leaf cuticle becomes superhydrophobic and retains a thin leaf gas films during submergence. The gas film enhances gas exchange with the floodwater so that CO2 for underwater photosynthesis is taken up during the day (and O2 excreted) whilst O2 is taken up from the floodwater during the night to sustain dark respiration. The identification of the gene Leaf Gas Films 1 (LGF1) opens up for possibilities to breed rice varieties that better tolerate floods in a future climate change scenario. Floods and salinization of agricultural land adversely impact global rice production. We investigated whether gas films on leaves ofsubmerged rice delay salt entry during saline submergence. 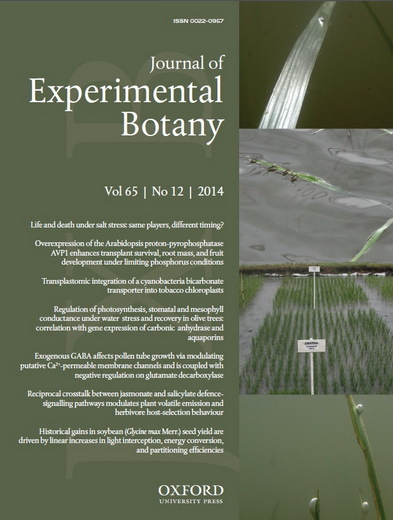 Two-week-old plants with leaf gas films (+GF) or with gas films experimentally removed (-GF) were submerged in artificial floodwater with 0 or 50mM NaCl for up to 16d. Gas films were present >9d onGF plants after which gas films were diminished. Tissue ion analysis (Na+,Cl- and K+) showed that gas films caused some delay of Na+ entry, as leaf Na+ concentration was 36–42% higher in -GF leaves than +GF leaves on days 1-5. However, significant net uptakes of Na+ and Cl-, andK+ net loss, occurred despite the presence ofgas films, indicating the likely presence of some leaf-to-floodwater contact, so that the gas layer must not have completely separated the leaf surfaces from the water. Natural loss and removal of gas films resulted in severe declines in growth, underwater photosynthesis, chlorophylla and tissue porosity. Submergence was more detrimental to leafPN and growth than the additional effect of 50mM NaCl, as salt did not significantly affect underwater PN at 200μM CO2 nor growth. Floods can completely submerge some rice (Oryza sativa L.) fields. Leaves of rice have gas films that aid O2 and CO2 exchange under water. The present study explored the relationship between gas film persistence and underwater net photosynthesis (PN) as influenced by genotype and submergence duration. Four contrasting genotypes (FR13A, IR42, Swarna, and Swarna-Sub1) were submerged for 13 days in the field and leaf gas films, chlorophyll, and the capacity for underwater PN at near ambient and high CO2 were assessed with time of submergence. At high CO2 during the PN assay, all genotypes initially showed high rates of underwater PN, and this rate was not affected by time of submergence in FR13A. This superior photosynthetic performance of FR13A was not evident in Swarna-Sub1 (carrying the SUB1 QTL) and the declines in underwater PN in both Swarna-Sub1 and Swarna were equal to that in IR42. At near ambient CO2 concentration, underwater PN declined in all four genotypes and this corresponded with loss of leaf gas films with time of submergence. FR13A retained leaf gas films moderately longer than the other genotypes, but gas film retention was not linked to SUB1. 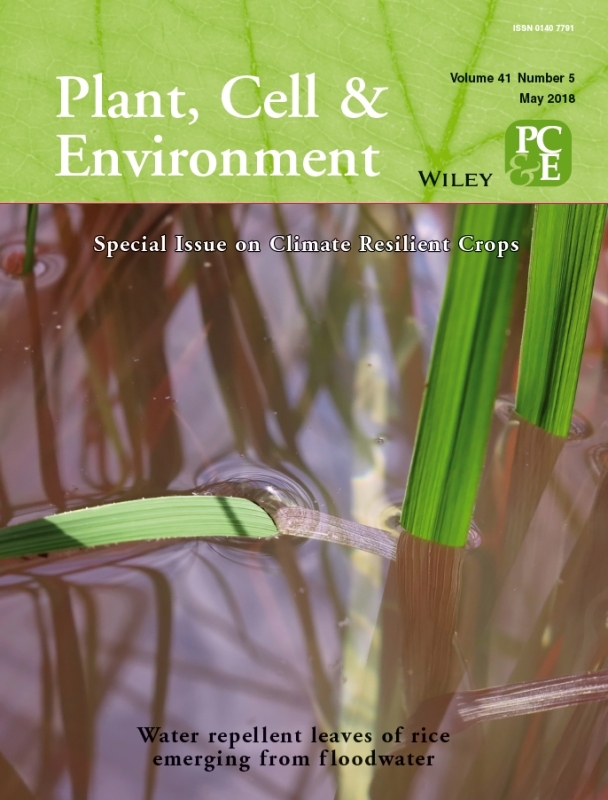 Diverse rice germplasm should be screened for gas film persistence during submergence, as this trait could potentially increase carbohydrate status and internal aeration owing to increased underwater PN, which contributes to submergence tolerance in rice.